Summer isn’t just about the World Cup… there’s also the gee-gees! Royal Ascot is always a big event for our race-loving customers, many of whom turn to our classy outfits to look the part at the racecourse. 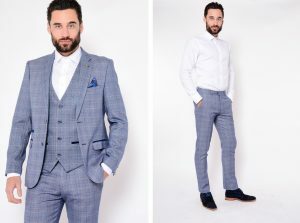 We have two fantastic British brands to help kit you out: Marc Darcy and Simon Templar. Both offer classy, well made jackets and trousers at very reasonable prices; we’ve even put a few bits in our sale! 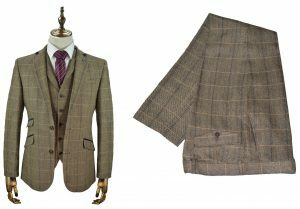 Use the offer code ASCOT18 at online checkout to save an extra 10% on all jackets, trouser and waistcoats! This cream blazer jacket will turn more than a few heads at Royal Ascot! Look closely and you’ll see a subtle multi-coloured check, perfect for matching with our wide range of smart casual shirts. The inside has a spectacular paisley lining, electric blue and pink, with a matching pocket hankie to round off the look. Ornate matching buttons and a Marc Darcy lapel pin badge are nice added touches. Sizes range from 38in to 48in. The Harding jacket is complimented by matching trousers, half-lined with a taped hem at the bottom. There’s a special “French fly” button inside the waist, designed to ensure a smoother fit and prevent the fabric from creasing up when sitting or standing. It’s the sort of attention to detail that makes us rave about Marc Darcy gear to anyone who’ll listen! All Marc Darcy trousers come in a slim tapered fit from sizes 30in to 38in. The “Harry” outfit is very similar in design to the previous garment, except for the dusky blue colour. A discreet check pattern is always a winner for a smart outfit like this one, and Marc Darcy pull it off to a tee. As for a matching shirt, we recommend Guide London’s self colour check shirts, or even Jiggler Lord Berlue’s woven pattern shirts. With sizes ranging from 38 to 48, we’re sure you’ll find your perfect fit. Marc Darcy trousers are cut in a simple tapered fit that the vast majority of our customers prefer. Rather like our slim tapered jeans, they’re generous enough around the thighs to suit cyclists and gym guys. Sizes run from 30in to 38in, and the waist is adjustable to suit those who fall in between sizes. 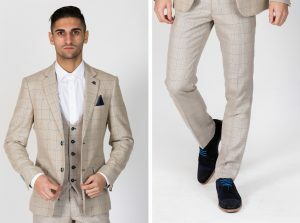 Here’s a more sober suit for your Royal Ascot wardrobe, made with a tweed style fabric. We’re very fond of the classic navy blue lining with a kind of fleur-de-lis retro pattern, along with a matching pocket square. The front pockets have a blue suede trim, and there’s plenty of interior pockets for security. Understated but classy, the “Scott” outfit is a real winner. To complete the full look you’ll need the Scott trousers! Once again it’s made with a half lining to keep your legs cool and comfortable in the warmer months. Cut in a semi tapered fit from 30in to 38in. Simon Templar’s smart, affordable blazer jackets have sold like hot cakes this year at Apache — and now it’s all in our half price sale! 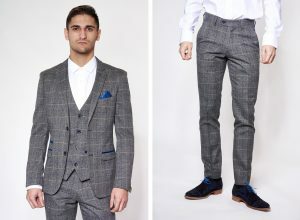 Customers love the vintage tweed patterns of the “Giles”, which comes in a full outfit with trousers and a blazer jacket — and much to our surprise, it has sold amazingly well with jeans. Don’t forget to type in ASCOT18 at online checkout to save a further 10% on all jackets and trousers. PreviousJoin Our Hot Summer Sale With 50% Discounts!